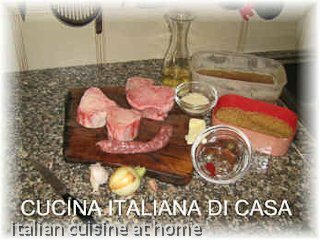 Recipe: ingredients and history of the risotto alla Milanese, Italian traditional recipe of Milan. The most classic of the risotto in Milan, town of the risotto. Nowadays quite impossible to find. Among the many tales existing about its origin we propose this one: during the construction of the Duomo (the gothic cathedral of Milan) there was the belief that the gold added to food brings great luck. So many nobles added a little of gold to their dishes and in the important meals it was the same also for other people. At that time the daughter of the Glass Master working at the construction of the cathedral had to be married. But the man was not rich, so it was not possible to buy gold for the wedding meal…but he was much beloved. 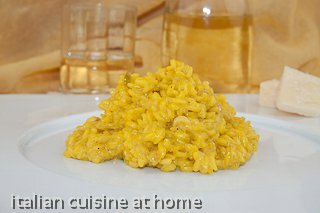 One of his apprentices, as surprise, decided to add to the risotto, while cooking, a little saffron (used for colouring the Duomo glass windows). The result was so liked that..